Truffle pieces offer the best value on our website. Contemporary recipes seldom require the presentation of whole truffles. Most chefs cut truffles in pieces during preparation of a recipe. When bying "pieces", you are effectively getting large pieces of black truffles at a discounted price due to the fact that they have been cut during the cleaning or harvesting process. Knowing that you will most probably cut the truffles into pieces before serving them, this product offers the best value of our catalogue. This product contains pieces of brushed black winter truffles, harvested in France during peak season. These 'Perigord' truffles are preserved after a 1st boiling in order to retain maximum flavor and aroma. They are preserved in the truffle juice produced during the boiling process. 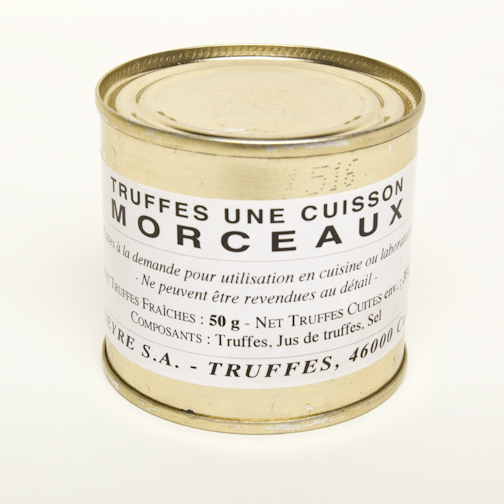 Each can contains approximately 75% truffles and 25% truffle juice. The truffle juice is delicious and can be used for cooking in recipes. Pieces: Pieces of good quality whole truffles after the removal of parts which have been damaged by frost, dryness or during picking. 1st Boiling: Canned after the first boiling which retains maximum aroma and flavor and yields 75% truffles and 25% truffle juice.